Vintage Eyewear for Women - a Statement of Individuality. It is very easy to recognize the origin of vintage women's eyewear from the time of style-defining designers. The already very rare vintage sunglasses for women were already something very special in the 60s, 70s and 80s. Famous models, actresses or singers often wore very special eyewear or the creations by only one selected designer. Marilyn Monroe, for example, is known for her Cateye eyewear, Jackie Onassis is immediately associated with oversized, round XXL sunglasses, and Audrey Hepburn for her Wayfarer-style sunglasses worn in “Breakfast at Tiffany's”. 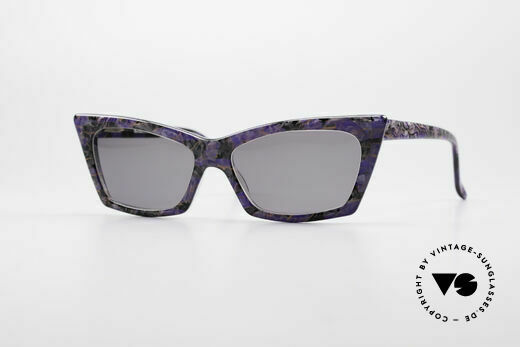 The Italian actress Sophia Loren often wore sunglasses with the colorful designs by Pucci, and Brigitte Bardot soon launched her own collection of extraordinary women's sunglasses. If you want to give your outfit an even more individual touch, vintage sunglasses are the ideal accessory. Beautiful ladies sunglasses from the 70s, 80s, and 90s. Our selection of women’s vintage sunglasses ranges from small cat eyes glasses in Marilyn Monroe style to giant shades á la Jackie O. But no matter which of these unrivalled vintage designer models you fall for, they all have one feature in common – they perfectly capture the authentic zeitgeist of the past decades. round frame in SMALL size 53/18 (120mm width)! the 2012 re-issue of the 1982 MIKLI model "030"
this model (251/600) is unworn + original packing! NO retro specs, but a precious 29 years old ORIGINAL! NO RETRO SHADES, but a 30 years old ORIGINAL!! hexagonal lens shape - just fancy & truly unique! FLASHY octagonal shape with "MIKLI RED"
NO retro fashion, but an authentic old 90's original! hand made frame is decorated with small rhinestones! NO retro glasses; an old Mikli original from app. 1985! NO RETRO SHADES, but a 20 years old ORIGINAL!! vintage 80's sunglasses from Paris, the fashion city! NO retro fashion, but a rare 29 years old original! NO RETRO SHADES, but a 33 years old ORIGINAL!! handmade quality and 123mm width = SMALL size! extraordinary 'square panto' design, UNIQUE! NO retro fashion, but a rare 30 years old original! pure extravagance, wings-shaped with "plume effect"
a piece of fashion history - vertu - actually invaluable! NO RETRO sunglasses; the old ORIGINAL from 1987! famous for the "screw design" and for "W.Germany"
unworn; but (storage) scratches on the paintwork! never worn, New Old Stock (NOS), collector's item! extraordinary color in a kind of "dark petrol / black"
desired model by vintage insiders & "fashion victims"
NO RETRO SHADES; but a are old 1990's ORIGINAL! true rarity (pure natural material - handmade), vertu! NO retro sunglasses, but a precious old ORIGINAL! NO RETRO EYEWEAR; but a 20 years old ORIGINAL! "Movado" is Esperanto for "being in eternal motion"
NO retro sunglasses, but an old rarity (made in Austria)! NO RETRO SHADES, but an app. 30 years old ORIGINAL! NO RETRO fashion; an ORIGINAL from the early 90's! NO retro eyeglasses; an old original from app. 1995! 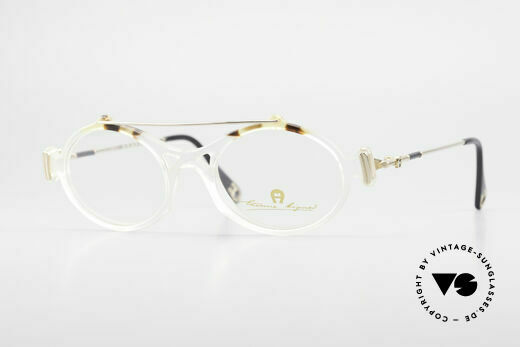 22ct gold-plated and great frame pattern in "Tiger red"
NO RETRO specs, but a true vintage original from 1996! timeless vintage ORIGINAL in 46mm (SMALL size)! NO retro eyewear, but a rare old Cartier ORIGINAL! 135mm temples and 130mm width = a MEDIUM size!! NO RETRO eyewear; a 35 years old vintage ORIGINAL! 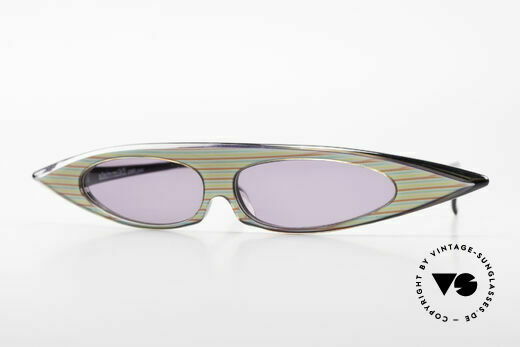 NO RETRO eyewear; a rare 25 years old vintage ORIGINAL! 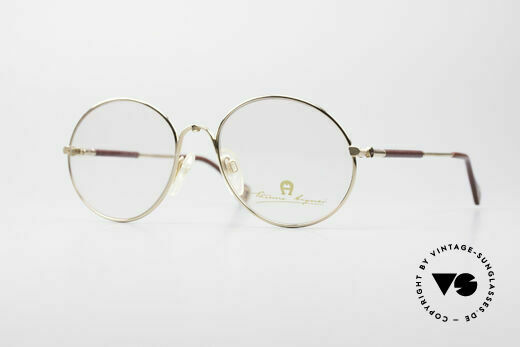 NO RETRO eyewear; a rare 30 years old vintage ORIGINAL! NO RETRO EYEGLASSES; but a 20 years old ORIGINAL! unworn condition, single item, true vintage rarity! with new blue-gradient sun lenses; 100% UV protect. luxury frame (22ct gold-plated) with full orig. packing! breath on the lenses to make the CARTIER LOGO visible! the lenses fit all Vendome versions in LARGE (62) size!! the lenses fit all Vendome versions in MEDIUM (59) size! NO RETRO eyewear, but an old 1980's ORIGINAL!! NO RETRO SUNGLASSES, but an unique old 80's rarity! distinctive Venetian design in style of the 18th cent. NO RETRO EYEGLASSES, but a true old ORIGINAL! NO retro glasses, but an unique old designer ORIGINAL! shades with different colored sun lenses; FANCY! unworn (N.O.S.) single item: really a piece of art! design: full of verve and something really different! NO retro specs, but an unique old designer original! true eye-catcher with brilliant colors & forms; vertu! unworn single piece (true collector's item); LIMITED !! this CASANOVA model is called SC3 "standstill of time"
this Casanova vintage model is called SC5 "EVOLUTION"
WHO KNOWS THE MEANING / the name of model SC-8? plain design with clear and pures lines; just timeless! NO RETRO shades, but an original from the 1980's! NO RETRO EYEGLASSES, but a unique old CAZAL rarity! NO RETRO EYEGLASSES, but a genuine old ORIGINAL! NO RETRO SUNGLASSES, but a genuine old ORIGINAL! extraordinary, hexagonal lenses - true vintage! made in Passau (Bavaria), "FRAME WEST GERMANY"
distinctive frame design and noble coloring; unique! NO RETRO FASHION, but a real 30 years old rarity! NO RETRO FRAME, but a unique old 90's ORIGINAL! NO retro fashion, but an app. 27 years old rarity! NO retro frame, but an app. 25 years old original! NO RETRO specs, but a 25 years old ORIGINAL! great metalwork & overall craftmanship; Top! NO retro glasses, but an original old designer piece! fashionable designer piece, full of verve; true vintage! NO RETRO EYEWEAR, but a 28 years old ORIGINAL! unworn condition 'new old stock' - truly vintage! NO RETRO frame, but a 25 years old ORIGINAL! NO RETRO Eyewear, but a 25 years old ORIGINAL! color description in the old catalog: "gold brown-black"
NO RETRO GLASSES, but true 90s designer sunnies! NO RETRO GLASSES, but true VINTAGE eyeglasses! NO RETRO glasses; a 20 years old ORIGINAL! NO retro sunglasses, but an old CAZAL original! NO RETRO fashion, but a rare old Cazal original! NO retro sunglasses, but an authentic 90's rarity !! original Cazal sun lenses with 'UV PROTECTION' mark! NO RETRO sunglasses, but a 25 years old Cazal original! NO RETRO eyeglasses, but a 25 years old Cazal original! NO RETRO FASHION, but a genuine 25 years old rarity! perfect frame for an individual look; cult sunglasses! 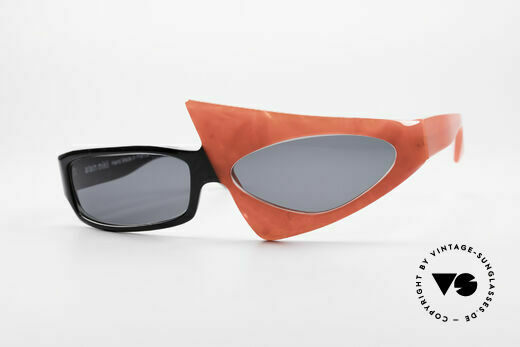 NO RETRO FASHION, but true 90's ORIGINAL shades! outstanding quality (You must feel it! ); - monolithic! NO retro shades; a 25 years old rarity + Dior case! playful metal frame construction - pure extravagance! NO current RETRO fashion - but real 90's commodity! original 1990's CAZAL designer sunglasses; true vintage! extraordinary 'brown mottled' frame finish; just unique! a real 'MUST HAVE' for all lovers of quality and design! tangible (made in Germany) top quality; 100% UV prot. NO RETRO eyewear fashion, but a unique old rarity! finest quality and shiny like fresh from the factory! NO RETRO SUNGLASSES, but a unique old RARITY! NO RETRO EYEGLASSES, but a unique old RARITY! incredible top-quality (You must feel this!) - vertu! NO RETRO fashion, but an outstanding old original! top notch 90's quality 'made in Germany; vertu! NO RETRO glasses, but an authentic old original! NO retro sunglass-fashion, but a 20 years old original! NO RETRO SHADES; but an app. 25 years old ORIGINAL! NO RETRO; but a 25 years old ORIGINAL in SMALL size! engineered for the drivers (Paris-Dakar-Rallye); rarity! high-end quality (built to last) & industrial style!